How about this for a front three? Goals. Here, there and everywhere, as the young, old and those who come from the bench show they know where the back of the net is. Arsenal, Manchester City, Marcus Rashford and Michy Batshuayi are all on target, while Swansea cannot stop putting the ball into their own net. Stoke's Darren Fletcher marks a rather different landmark and Diego Maradona becomes part of a record Premier League crowd. BBC Sport looks at the most interesting stats from the weekend's action in the Premier League. "I always had the belief that I'd be back playing," said Darren Fletcher after doctors told the then Manchester United midfielder his debilitating medical condition meant there was a "real possibility" he might not take to the pitch again. Fletcher made only one start for United in the final two months of the 2010-11 season and appeared only 10 times in the following campaign. It was announced in December 2011 he would take an extended break from the game and he finally had surgery for the chronic bowel disease ulcerative colitis in January 2013. Nearly five years on, 33-year-old Fletcher has just played his 100th successive Premier League game, becoming only the eighth outfield player to do so. The Scotland international, whose run spanned 91 appearances for West Brom, has started every game for Stoke this season, including the 2-1 home defeat by Bournemouth on Saturday. That is 15 more games than any other current streak. Watford goalkeeper Heurelho Gomes is on 85, while Cesar Azpilicueta, with 70 consecutive appearances for Chelsea, is the closest outfield player to Fletcher. But Fletcher will need to feature consistently for nearly two more seasons if he is to top Frank Lampard's record for an outfield player of 164 consecutive matches. Both have to go some way to match the all-time Premier League record, with goalkeeper Brad Friedel playing 310 games in a row during spells at Blackburn Rovers, Aston Villa and Tottenham Hotspur. When Marcus Rashford headed in for Manchester United in Saturday's 2-1 defeat by Huddersfield, it was his 13th Premier League goal. Thirteen Premier League goals as a teenager. Only Wayne Rooney, with 15, has more in a Red Devils shirt. So how do 19-year-old Rashford and Rooney, who was scoring from the age of 16 for Everton, compare to the rest of the Premier League's all-time top teenage sharp shooters? Michael Owen leads the way, with the first of his 40 Premier League goals as a teenager coming on his debut against Wimbledon as a 17-year-old. The striker would win the Golden Boot in the following two seasons, with 18 goals in each campaign before his 20th birthday. It was the most prolific form of Owen's career. Rashford, who was a year older than Owen when he made his debut, has no chance of bettering the former England striker's record. Rashford turns 20 on 31 October and a home game against Tottenham is all he has left for his teenage years. 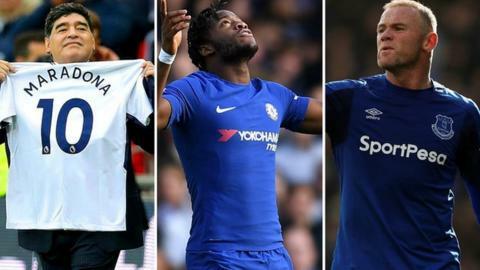 With Chelsea trailing to Watford at Stamford Bridge, manager Antonio Conte sent out a distress signal and from the substitutes' bench rose Michy Batshuayi. It was a case of cometh the hour-mark, cometh the Batsman for the Blues as the Belgium forward netted twice in a 4-2 victory. Batshuayi has scored seven goals for Chelsea since his arrival at the beginning of last season, with six coming when he was brought on off the bench. Only Arsenal's Olivier Giroud, with seven, has scored more as a substitute in that time. So who are the Premier League's all-time leading super subs? Jermain Defoe is the most trustworthy option for a manager in need of a goal. He has netted 23 times in games he has not started, while former Manchester United poacher Ole Gunnar Solskjaer and ex-Arsenal, West Brom and Portsmouth forward Nwankwo Kanu also enjoyed success from the bench. Arsenal beat Everton 5-2 on Arsene Wenger's 68th birthday. The Frenchman also enjoyed victories on his big day in 2005 and 2006. Sunday's 5-2 victory was the Gunners' 95th in English Football League history against the Toffees, the most victories for one club over another. Arsenal boss Arsene Wenger has had more success against Everton than any other team, winning 31 times in all competitions, while the Gunners took their total goals scored against the Goodison Park side to 100 in the Premier League - the first time a club have hit a century against an opponent. Wayne Rooney made sure he kept up his tradition of scoring against Arsenal. His 12 Premier League goals are more than anyone else has scored against them, and the latest came 15 years to the week after his first in the same fixture as a 16-year-old. The 12 goals scored in the Premier League on Sunday equalled the record for the most goals scored when only two games were played - in February 2004, Tottenham drew 4-4 with Leicester and a Midlands derby between Birmingham and Aston Villa finished 2-2. It finished north London 9-3 Merseyside in Sunday's fixtures, and a Premier League record crowd of 80,827 turned out for the second instalment as Spurs beat Liverpool 4-1 at Wembley. Even Argentina legend Diego Maradona and NBA star Kobe Bryant were watching as Tottenham took Liverpool's tally of Premier League goals conceded beyond the 1,000 mark - a table Spurs top with 1,237. Thirteen of Liverpool's 1,002 goals conceded have come as a result of an error by Simon Mignolet. He was at fault for Spurs' fourth on Sunday and has made more mistakes leading to goals than any goalkeeper since his Liverpool debut in August 2013. Jurgen Klopp's side have shipped 16 goals in the league this season, their worst defensive record after nine games of a top-flight campaign since 1964-65 when they conceded 20. A staggering 15 of those have come away from home this term. How do you solve a problem like Jose Mourinho's Manchester United? Go two goals up. Huddersfield did just that on Saturday, and it proved too much of an advantage for Mourinho's outfit to overturn as the Terriers recorded their first win over United since 1952. In fact, the Portuguese has failed to win any of the 19 Premier League matches in which his side have gone two goals down. He did manage one draw, with Chelsea against Newcastle in September 2015. Aaron Mooy and Laurent Depoitre's efforts also consigned Mourinho to only his third defeat by a newly promoted side in 40 attempts as Huddersfield joined Crystal Palace and Bournemouth. Just how good are Manchester City? Manchester City opened a five-point gap at the top of the Premier League with a 3-0 victory over Burnley on Saturday, but just how good are Pep Guardiola's side? Federico Fernandez's own goal against Leicester on Saturday was the 13th time the start of the 2015-15 season that Swansea have put the ball into their own net. That's more than twice as many own goals than any other Premier League club, and it cost the Swans as they slipped to a 2-1 defeat. But Fernandez and Swansea are by no means the top flight's worst offenders. Richard Dunne has 10 on his own. The ex-defender's former club Everton top the charts, scoring 47 own goals in the Premier League era, while another of Dunne's sides, Aston Villa, deserve a special mention with 45. And so, with a 1-0 victory over Roy Hodgson's Crystal Palace at St James' Park on Saturday, Newcastle boss Rafael Benitez extended his unbeaten home league record against managers who have also coached the England national team - winning 17 and drawing four.